What Problems Do Wild Animals Cause? Wild animals can be cute and interesting when they are located in their natural habitat, but for those who encounter these animals in and around the domestic property, or in an urban setting, they can be a serious problem. The types of issues caused by these animals will range from nesting within the domestic home through to noise and scavenging behavior, and even attacking domestic animals that come across the wild animals. The most difficult thing for many people is dealing with these problems, as they can be a real inconvenience and cause damage that will cost money to repair, and the solutions to these wildlife problems are not always obvious. This is something that is quite common, and can be very varied, ranging from burrowing animals that dig in underneath a corner of a building or under a shed, or even digging their way under a porch or deck area. Once they are underneath, not only can this in some cases destabilize the structure, but the animals may also gnaw or claw pipes and cables, which can cause even more serious damage than what the animals have done themselves. Where the problem animals gain access to the roof area they can cause problems such as loosening roof tiles or even damaging a chimney cap, which can be costly to repair. There are many animals that find there is a lot to be said for domestic gardens and yards, and these areas of domestic properties will often offer attractive features such as shelter, food and a distinct lack of predators. However, once they are in the yard or garden, they can be a significant problem as they take food from vegetable plants and from fruit trees, while sheds and wood piles can often provide good areas of shelter. While the fencing around the garden can also be damaged by these animals, a good strong fence is also usually going to be one of the main solutions to prevent such animals from getting into your yard or garden. 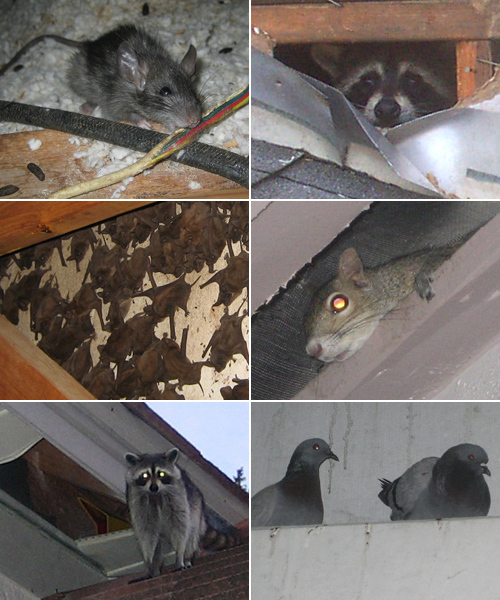 From squirrels through to raccoons, the warm, dark attractions of an attic space are very welcoming for wild animals as potential nesting spots, but once they gain access to the attic they can cause a lot of damage. One of the most expensive problems will be the insulation, which will often be contaminated by urine and feces, and this will usually need to be cut out and replaced with fresh insulation once the animals have been removed. Most species that are found in the roof will be rodents, which mean they will almost all gnaw, causing damage to wood and any cables or wires running through the attic. Whether it is the food of animals that is stored in a garage or shed, or the food that is stored in cupboards or pantry, animals such as mice and rats can contaminate this food if they gain access to it, and can transmit some very harmful diseases. If such contamination is discovered then all of the food in the cupboard should be disposed of, as it can be very difficult to identify what is safe to eat and what isn't. Water contamination is less of a problem for humans, although wild animals defecating or urinating in the water sources of pets or other domestic animals can also be an issue. This is probably one of the messiest problems that many people will encounter with wild animals, with feral cats and raccoons among the animals that can commonly tear through garbage sacks to get to the food inside. This is very messy, as it can cause the garbage to be scattered across the yard or garden, while the smell of the food that has been unearthed by these animals can draw more unwanted wildlife too. The best way to deal with this problem is to make sure that garbage sacks are stored in a secure container such as a bin, preferably with a fastened cover to prevent any animals from knocking the lid off. It is also best to try and use a waste disposal unit rather than dumping waste food into the garbage, which can cause a smell that will attract animals. Domestic animals such as cats and dogs can be particularly prone to problems with wildlife, as they will have a curiosity about these animals but will not necessarily understand how dangerous they can be. Some animals can be aggressive, and transmit diseases such as rabies to domestic pets through bites or scratches. It is also worth bearing in mind that if you are using traps to try and deal with the wild animals, it is important to locate them in areas where domestic pets aren't going to get caught in the trap. Go back to the main How to Get Rid of Wild Animals page for more information about animal trapping and information about What Problems Do Wild Animals Cause.